Democrats in Olympia want to move quickly to cut car-tab taxes, which are being calculated based on inflated car values. But a bill that passed overwhelmingly last year was delayed as legislators consider the financial hit it to Sound Transit. Last year, a bipartisan push in the Washington Legislature to lower car-tab taxes fell apart in a partisan struggle. Now, with Democrats in control of both houses, they’re again trying to lower Puget Sound region car-tab bills. House Democrats had hoped to run a bill last week that would change how Sound Transit calculates a car’s value for taxing purposes. The House passed the same bill (HB 2201) overwhelmingly last year, and the leaders of both the House and the Senate said this month they would pass the bill quickly. But tentatively planned votes on the legislation were scrapped last week as lawmakers continued hashing out issues related to the financial blow the bill would deal to Sound Transit. The bill would mean lower car-tab taxes for people with cars less than 10 years old. It would also mean a loss of $780 million for Sound Transit over the next 11 years as it pushes to expand light-rail and bus service. Including indirect financial impacts, such as higher debt costs, Sound Transit says the bill would cost the agency nearly $2.3 billion from now through 2041. Sound Transit says it would respond to the loss by issuing more debt, sooner than it would have otherwise, and then eventually issuing more debt on top of that to pay the initial debt. 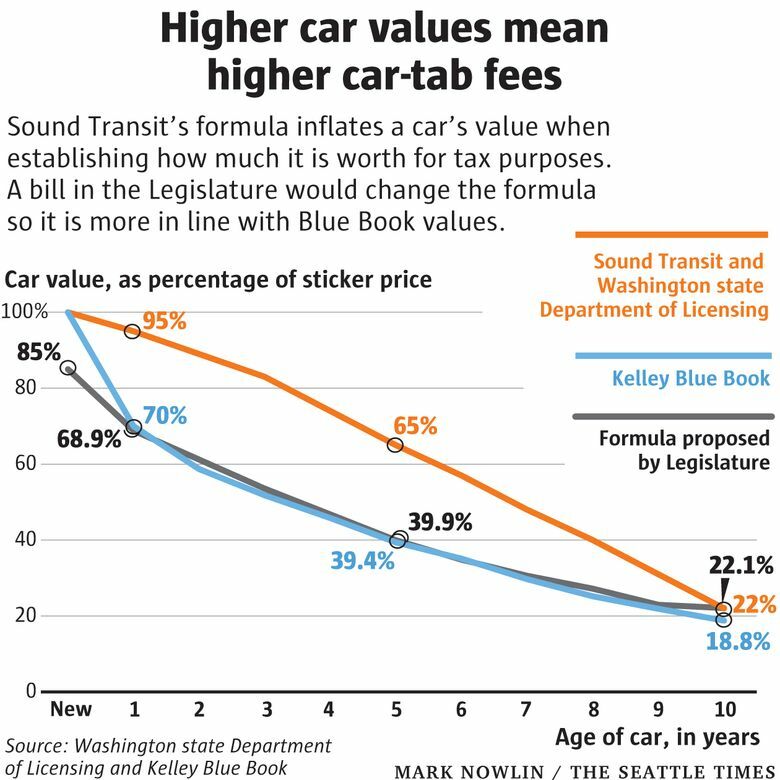 Sound Transit car-tab taxes are currently calculated using an outdated formula — approved by the Legislature — that inflates the value of cars that are less than 10 years old. Inflated car values mean the taxes on those vehicles are higher than they would be if taxes were based on a car’s Kelley Blue Book value. The bill would switch to a more accurate car-valuation formula, one that is already in state law but is currently unused. “People should only be paying taxes on the fair value of their vehicles,” said Rep. Mike Pellicciotti, D-Federal Way, the bill’s lead sponsor. Sen. Marko Liias, the Democratic floor leader, said they are committed to the same car-tab cuts, but were looking at different ways to lower Sound Transit’s costs and ensure light rail is not endangered. That could include giving the agency more favorable terms when it needs to lease state land for rail-line rights of way, legislation to streamline permitting, or even looking at a $500 million fund through which Sound Transit contributes to education funding, Liias said. “We just want to make sure that whatever we’re doing here to provide car-tab relief doesn’t make light rail delayed or canceled to the places it needs to go,” said Liias, D-Lynnwood. State lawmakers attempted to cut car-tab taxes last year, but came to loggerheads with Democrats proposing to switch to the more accurate formula and Republicans insisting on much larger tax cuts. Sound Transit, at the time, was not against the Democratic proposal to switch to the more accurate formula. Now, with Republicans no longer controlling the state Senate and the larger tax cuts off the table, the agency has taken a firmer stance. “Any reduction of [car-tab] revenues should be accompanied by offsetting measures to ensure that our transit expansion program remains whole,” Sound Transit spokesman Geoff Patrick said. Voters approved the ST3 plan, including 62 new miles of light rail and massive expansions in bus and commuter rail service, with about 54 percent of the vote in 2016. Patrick noted “major threats” the agency is facing in soaring construction and real-estate costs and the possible loss of federal money. President Donald Trump has proposed cutting $1.1 billion in previously recommended funding for the light-rail extension between Northgate and Lynnwood, half of that project’s entire funding. Many transit advocates — who typically support Democrats — oppose Pellicciotti’s bill, fearing it will imperil Sound Transit’s ability to deliver its massive projects. “It’s time for Democrats to show a backbone and stand up for transit,” the advocacy group Seattle Subway wrote. Another Democratic proposal (HB 2357), which is supported by Sound Transit, would give car owners with tabs costing $200 or more the option of paying the annual tax using a quarterly payment plan, instead of in one lump sum. But a $5 fee on each payment means car tabs would actually rise for those who used the payment plan. “What this bill is really about is giving families the option to fit this voter-approved initiative into their budget in a way that works best for them,” said lead sponsor Rep. Kristine Reeves, D-Federal Way. How big a tax cut? Pellicciotti’s bill is designed to avoid changing Sound Transit’s car-tab taxes implemented in the 1990s, since doing so would endanger bonds the agency has already sold. Under the bill, your car would essentially be taxed at two different values — a 0.3 percent tax authorized by the 1996 Sound Move initiative would be levied on the inflated value, while a new 0.8 percent tax from ST3 would be levied on the more accurate value. Just how much lower would car tabs be if the changes become law? In Seattle, the city, county and state collect car-tab fees of at least $140 for most cars. Those would not change. The rest — the Sound Transit portion — depends on your car. Newer, more expensive cars would see the biggest tax cut. Cars more than 10 years old would get no tax cut. Take, as an example, a 2014 car with a sticker price of $15,000. Sound Transit taxes cars at 1.1 percent of their estimated value. Currently, using the old, inflated valuation table, Sound Transit estimates that car’s 2018 value at $11,100, which produces a tax of about $122. Under the proposed bill, Sound Transit would levy a 0.3 percent tax based on the car’s value under the old, inflated valuation formula, and a 0.8 percent tax based on the new, more accurate formula. The new formula values that 2014 car at only $6,750. That produces a car-tab bill, for Sound Transit, of about $87, a tax cut of about $35.